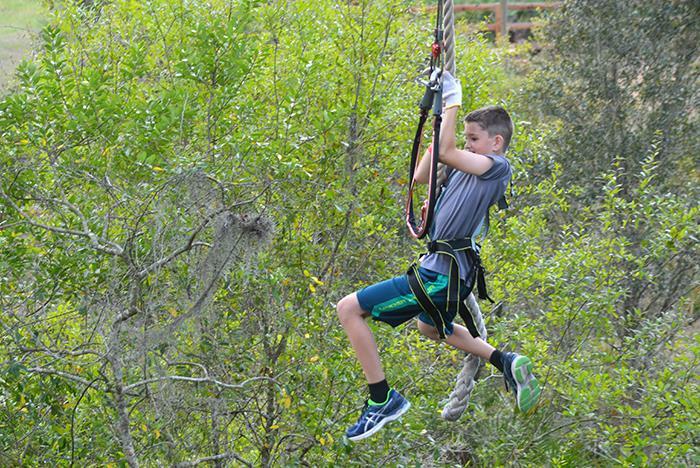 Head to the trees for an action-packed adventure full of climbing, swinging, soaring, and more. TreeUmph! 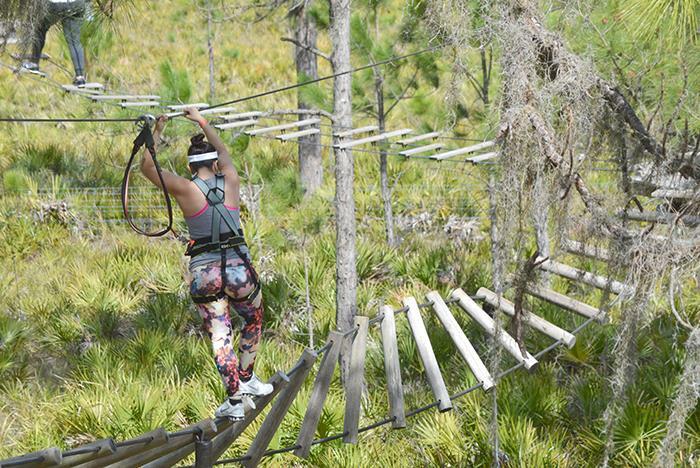 Adventure Course features wobbly bridges, hanging nets, swinging logs, foot bridges, Tarzan ropes, and ziplines for an experience like no other. This is a fantastic activity for ages 7+. With multiple courses, no two adventures are the same! Guests need to be 9+ years of age to participate. For your safety, guests must be able to fit into a 44-inch waist harness. Guests must weigh less than 275 pounds. Guests must wear closed-toed shoes. Action-Packed Adventure in the Trees! 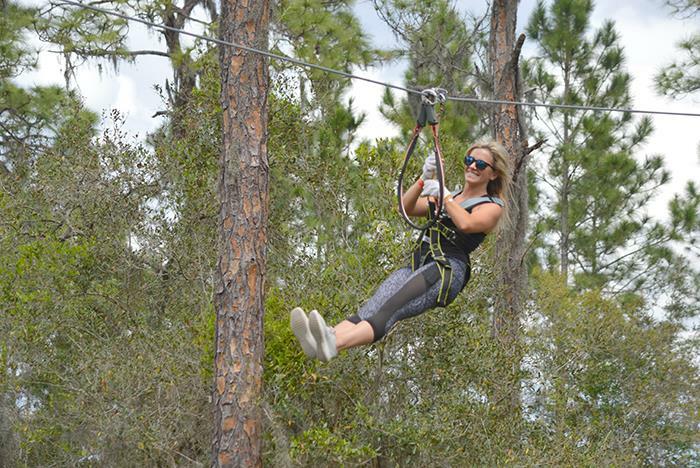 Get your feet off the ground and into the trees at TreeUmph! 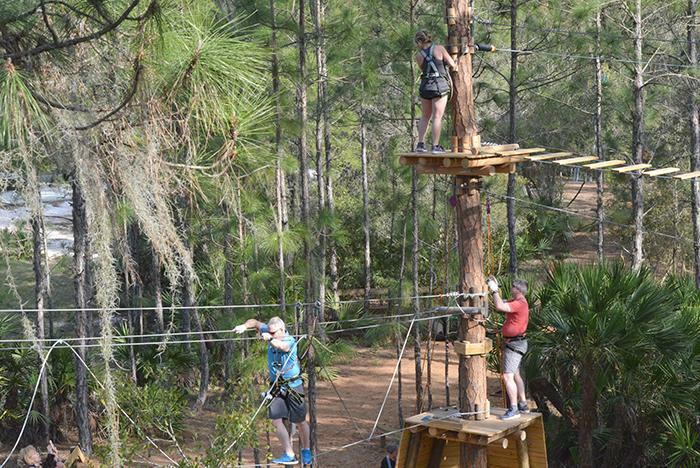 Adventure Course, Southwest Florida’s best treetop obstacle course! 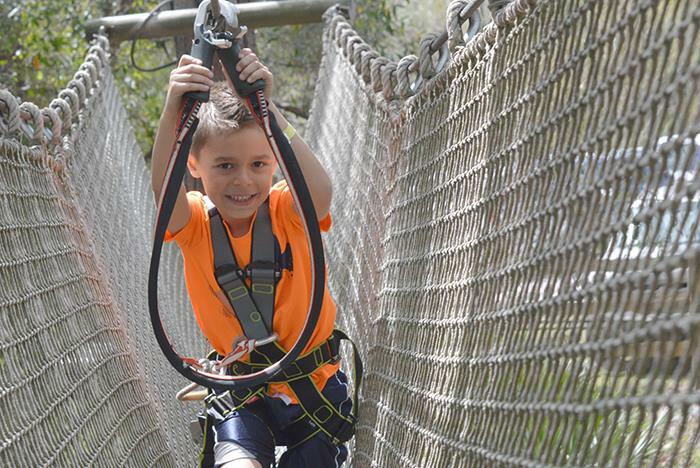 Book your reservation and swing into action for a full day of play on 5 courses that progress in height and challenge level, 103 elements including wobbly bridges, hanging nets, swinging logs, foot bridges,Tarzan ropes, ZIP lines and more! Set in an expansive park over 10 football fields in size, TreeUmph! 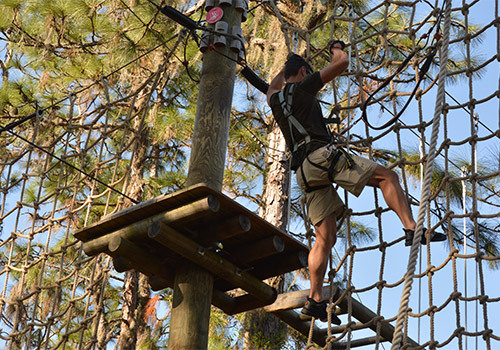 Adventure Course is your 5 star rated destination for high-flying, obstacle-defying fun! A day in the park just got a lot more fun. At TreeUmph! 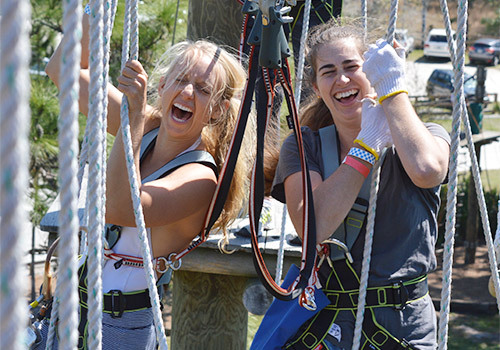 you'll feel the exhilaration of climbing, zip lining, and swinging from 15 to 60 feet in the air, all while harnessed to equipment designed with the most rugged materials and highest safety standards. Safety is paramount, so you will start out watching a safety video where you learn the rules of the park and how to stay safe. Then it's on to the Practice Course where you prove to our guides that you are safe to climb. Adult Ticket holders make their way through five progressively difficult courses. There is fun for everyone, but only the fittest will reach the last and most extreme course, a true test of strength, agility, endurance and nerves! The grande finale is the 650ft Triumph Zipline, where you sit back and enjoy the wind in your hair soaring up to 60 ft high through the air. Adult Ticket Courses typically take 3-4 hours to complete. Junior Ticket holders test their inner monkey by making their way through the first 3 of the 5 adult courses. 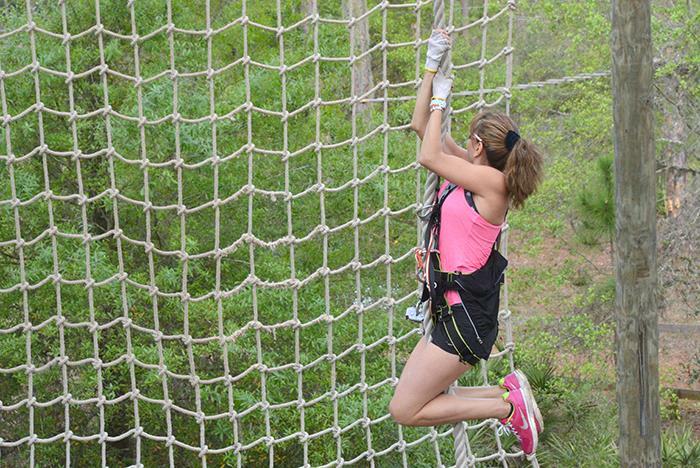 If you listen closely you can hear them screaming AhhhAhah as they swing like Tarzan from a 20-ft high platform into a huge cargo net and then traverse the net and move on to other challenging obstacles. Juniors also complete their day soaring on the ride of their life down the 650ft Triumphant Zip Line. The Junior Ticket Courses typically take 2.5-3 hours to complete. While traversing through the challenges our guides will keep a close eye on you to ensure your safety. Should you decide you have pushed yourself to your limits, they are always available to climb to you with rope and rescue gear to lower you safely to the ground. Adventure begins at 8:30AM and leaves every 30 minutes. All guest must weigh less than 275 pounds to be able to participate. Yes. Each guest who participates MUST complete an Acknowledgement and Waiver of Risk form. This form is required by the State of Florida and informs our guests of the inherent risks of the activity. If a guest is under 18 years of age then the waiver MUST be completed in part by their parent or legal guardian. Is this activity appropriate for all ages? Too young to participate, but always welcome as spectators! May purchase a junior ticket. MUST be able to reach the tips of their fingers with both hands above their head to a height of 5' 9″ (175 cm) while keeping their feet flat on the ground. MUST ALSO be directly supervised in the trees by a ticketed parent or guardian who is able to climb with them. Can purchase an adult or senior ticket. 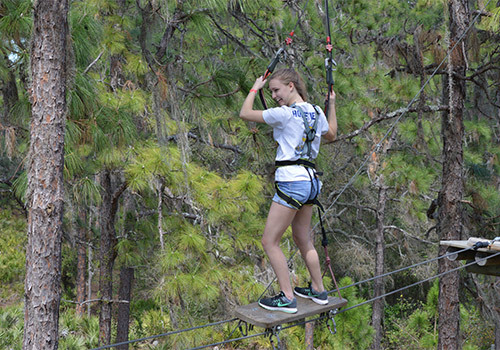 If participant is under 16 years old, they MUST be directly supervised in the trees by a ticketed parent or guardian who is able to climb with them. Are there any weight restrictions in place? Yes. Guests MUST be able to fit into a 44-inch waist harness and weigh less than 275 pounds. TreeUmph! 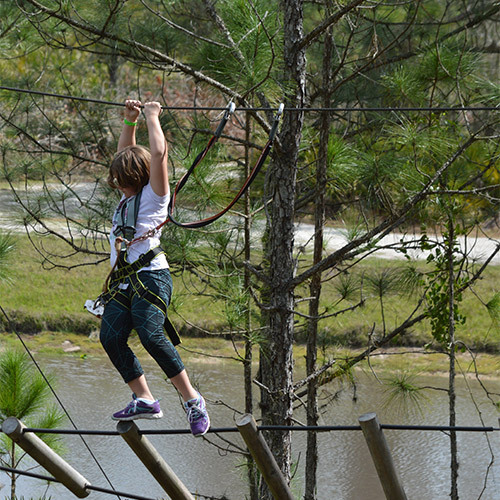 Adventure Course is a RAIN or SHINE activity. In the case of severe weather, the park reserves the right to close and/or take precautions for the safety of guests. Should severe weather occur while you are on the course, listen and adhere to the instructions from course instructors. By purchasing a ticket you agree to our policy that refunds or rain checks are NOT given for wet, hot or cold weather. Most storms pass quickly in Florida. Our goal is to get you back on the courses as soon as it is safe to do so. We will continue to monitor the storm after all guests are safely down from the trees. We ask you to wait for the weather to pass and for Management to decide if guests will be able to return to the courses. Total wait time will not exceed 1.5 hours. 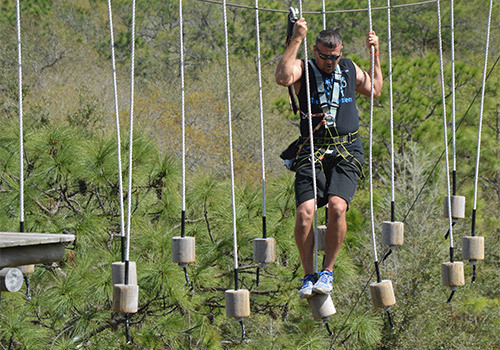 If after 30 mins, you choose not to wait and have not yet finished the last course of your ticket including the Triumph Zip Line, then you can receive a coupon for a ½ price ticket to return on another day. If you choose to wait and Management decides it is safe to return to climbing before the 1.5 hours wait time, then you will be allowed to re-start where you left off on the courses. No rainchecks will be issued if guests are allowed to return to the courses. You must wait on premises. If you leave the park for any reason then you lose your claim to a rain check. Guests that have not started the courses or are still on the demonstration course are entitled to a rain check without waiting if they prefer. All coupons and rain checks are subject to future availability. 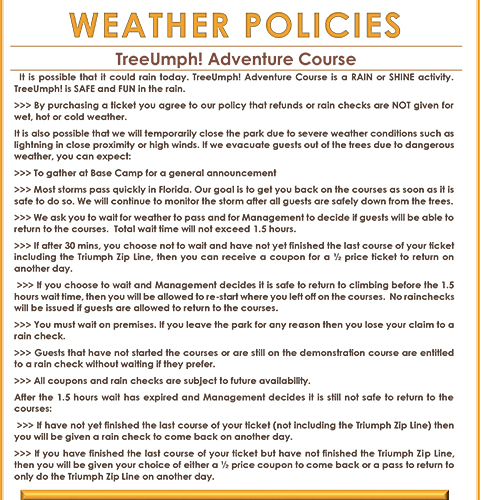 If you have not yet finished the last course of your ticket (not including the Triumph Zip Line) then you will be given a rain check to come back on another day. 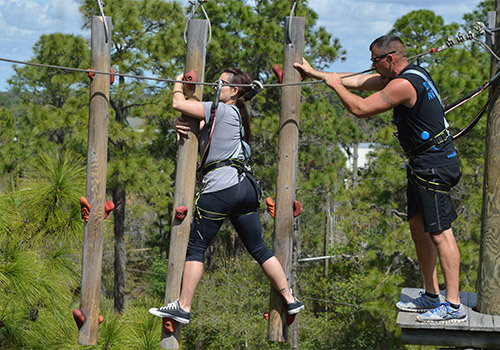 If you have finished the last course of your ticket but have not finished the Triumph Zip Line, then you will be given your choice of either a ½ price coupon to come back or a pass to return to only do the Triumph Zip Line on another day. Participants begin by watching a safety video where they learn the rules of the park, courses, and how to stay safe. Then guests move on to the Practice Course where they prove to our guides that they are safe and capable of climbing on the courses. Course length varies by course and age. Adult Ticket Courses typically take 3-4 hours to complete, while Junior Ticket Courses typically take 2.5-3 hours to complete. October 1 - May 31: Open daily, except Wednesdays. Start times every 30 minutes between 9:00 am and 12:00 pm. June 1 - August 30: Open daily, except Wednesdays. Start times every 30 minutes between 8:00 am and 11:30 am. September 1 - October 31: Open Thursday through Sunday. Start times every 30 minutes between 8:00 am and 11:30 am.